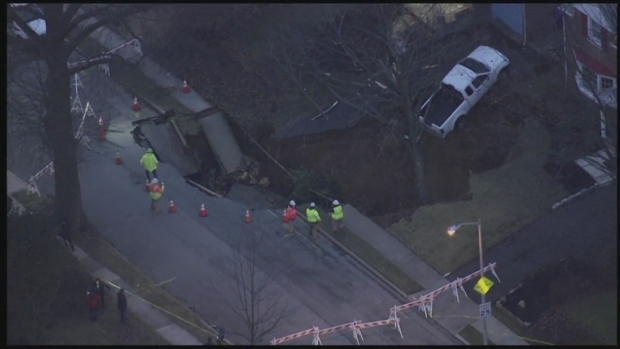 A boil water advisory is in effect for customers impacted by a large sinkhole that opened up overnight in the middle of a Montgomery County community. The sinkhole opened up along Brooke Road near Argyle Road in Glenside, Cheltenham Township, before 4 a.m. Wednesday, gobbling up the yards of at least two homes, leaving a pickup truck teetering on the edge and creating fears that the homes could sink. "I came out here to take a look at what was going on and I was shocked at what I saw," said neighbor Kurt Baker. Baker wandered outside when he noticed his water pressure was low. "I heard a sort of a loud boom and what they heard was the water rushing through," Baker said. No injuries were reported, county dispatchers said. What's Next for the Dakota Access, Keystone XL Pipelines? The residents of the home tried to go out the front door but it was blocked by debris, so they wound up having to make their way out the back, according to witnesses. As SkyForce10 hovered overhead, crews could be seen responding to the crater, with a white pickup truck teetering into it, apparently holding on by only a few tree branches. The hole, which township officials estimated to be around 20 feet deep, takes up at least two yards and part of the street. One of the homes appeared to sink as the morning went on. A contractor later poured concrete to fill the two deepest areas of the sinkhole and stabilize it. Authorities have not yet said how the sinkhole opened up. Once out, residents of the affected home could be seen shaking their heads in disbelief, Baker said. Ron Forster owned the home about three decades ago. "We always wondered what was going on with the water table underneath... there was some water in the basement every now and then," Forster said. "Now we know." A 6-inch cast iron main broke and impacted water service to about 65 homes, according to Aqua Pennsylvania. As of 3 p.m., eight customers had their water restored. Officials expect the remaining customers to have their water service restored between 6 p.m. and 7 p.m. Wednesday. The large sinkhole opened up along Brooke Road in Glenside on Jan. 25, 2017. Church Road and Station Avenue can be used as alternate routes to Brooke Road. A boil water advisory remains in effect for impacted residents. Under the advisory, they must boil their water or use bottled water for drinking, making ice, brushing their teeth, washing dishes and food preparation until further notice. The customers should bring all water to boil, let it boil for one minute and then let it cool before using. Aqua expects to lift the boil water advisory on Jan. 28 but customers should continue to boil their water until they hear directly from Aqua or the advisory has been lifted. Customers can also call Aqua's emergency dispatcher at 877-987-2782 for further information. This sinkhole comes about two weeks after a sinkhole swallowed up cars and impacted utilities along a Philadelphia street.